What outfit can benefit from the addition of this deluxe black top hat? Sorry, that was a trick question. The answer is EVERY outfit will benefit from this accessory. Especially if you are a wizard, circus ring leader, or a magician. But seriously, it's fine to wear it whenever you want to look extra handsome. You can never go wrong with a great top hat. We think it goes with just about anything and you can dress it up or down, depending on your event. Maybe you are going to a zombie party and need a little extra something to set your costume apart from all the rest. Or perhaps you are headed to a formal evening out and want to look extra fancy. Or maybe it's a random Tuesday and you are feeling a bit more dapper than usual. Whatever your need, this top hat is at your service. 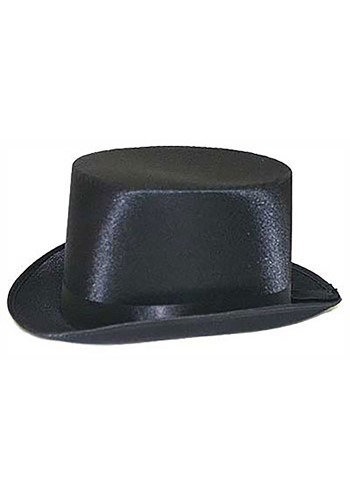 This black top hat is a classic top hat shape that is made of 100% polyester. The hat is adorned with black ribbon around the brim for that extra something special. Don't leave the house this Halloween without this formal top hat!